The North American Free Trade Agreement (NAFTA) is a trade agreement between the United States, Canada and Mexico, which came into force on January 1, 1994, creating one of the world’s largest free trade zones. The purpose of NAFTA was to remove barriers to the exchange of goods and services cross-border, and to increase the competitiveness of all three signatory countries in the global marketplace. NAFTA strongly focuses on trade liberalization in agriculture, textiles, and automobile manufacturing. The agreement also seeks to protect intellectual property, establish dispute-resolution mechanisms, and implement labor and environmental safeguards. 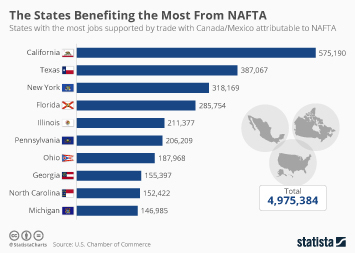 NAFTA is seen as highly controversial, and it is still unclear whether the trade agreement has presented more economic advantages or disadvantages for the signatory countries. As of 2014, an estimated 630 billion dollars of U.S. cumulative growth in import and export trade volume was attributable to the implementation of NAFTA. More than 2.2 million U.S. jobs were supported by goods exported to NAFTA countries in 2015. The U.S. is not the only country benefiting from its NAFTA membership. Roughly 250 billion U.S. dollars of Canada’s cumulative growth in trade volume was attributable to NAFTA. In a 2016 poll, around 44 percent of American respondents thought that the trade agreement had had a negative impact on the U.S. economy. Only 30 percent of respondents believed the United States should continue being part of NAFTA. A 2017 Canadian poll found that after U.S. President Donald Trump threatened to radically change the trade agreement, public opinion in Canada on NAFTA had changed from moderate to noticeably more enthusiastic. About 44 percent of Canadian respondents believed that their country has generally benefited from the NAFTA trade agreement , and 31 percent of respondents wanted the trade agreement to be strengthened and expanded.